These particular data notably excludes most of the oil rich gulf states, Singapore, and other high GDP countries where the disconnect between GDP and what is actually going on at a household level vis-a-vis disposable income, AIC, NHE, etc is particularly large (which would have helped illustrate of the limitations of GDP in this context). Still it’s useful for the time series and less OECD-centric nature of the data. I won’t bore you with too many of the particulars of how I constructed the data as it’s in the source code. To briefly review for those that have not read my prior posts on these topics: both household gross adjusted disposable income and actual individual consumption include net transfers from government, whether cash or in-kind (e.g., education, health care, etc). Which is to say that they are comprehensive measures of household income or consumption after the net effects of government taxes and transfers have been thoroughly taken into account (also note that a large proportion of welfare state transfers are actually cash, not in-kind). These two figures are very strongly correlated because household gross-adjusted disposable income is little more than AIC plus household gross savings and households generally spend a large and fairly predictable share of their disposable incomes when averaged over a whole country (or at least in the long term… in the short term people may consume out of savings). My view is that the allocation of resources towards health care is ultimately determined almost entirely by the average households’ real or perceived economic situation, both with regard to direct/out-of-pocket expenditures and indirect expenditures through government and private/employer based programs (at the voting booth, when picking jobs, benefits packages, etc…. even if lagged by a few years). Gross-adjusted household disposable income or AIC are far better indicators of this than GDP as GDP is several steps removed (resources can be allocated towards different sectors of the economy, allocated towards fixed capital consumption, and more). Although GDP is a usually decent proxy for this income concept (and thus usually a decent predictor of NHE) there can be substantial differences between countries’ economic situations that can make straight comparisons of GDP highly misleading, especially as it pertains to the household sector (as opposed to national disposable income). Beyond the potential general disconnect between GDP and material living conditions, I have found that even the allocation of disposable income between economic sectors has very different implications for what we can expect a country to spend on health care. Likewise for the allocation of GDP towards AIC versus other expenditure areas. Here is a simple animation of health expenditures over real AIC per capita. Both trend lines are 3rd degree polynomials excluding the USA. The thin blue line is the trend across all years whereas the dotted purple line is the calculated trend for each year. The annual trend line barely changes and largely matches the trend for the entire series, save for the high consumption territory at the start (not enough observations when USA is excluded!). What you’re not seeing here is strong secular trend of increasing intercept in the annual trend line. NHE is not rising inexplicably (e.g., inexplicable increase in “technology” or “health inflation”); it is only systematically increasing to substantial degree in countries with rising income/consumption. It is also quite obviously non-linear. Including year fixed effects and excluding USA and Luxembourg does not change this. As a percentage of AIC the non-linearity is also apparent by countries over time and between countries each year, although it is considerably noisier, especially amongst the poorer countries where small absolute changes in NHE can make a huge difference in percentage terms and chances for measure error are higher (unless they’re systematically over or under-estimating these should average out). As real incomes rise countries allocate an increasing share of consumption to NHE and this increases increasingly. We can show much the same for gross adjusted household disposable income. This makes the US appear to skew somewhat higher than the equivalent for AIC, but it still paints a vastly different (more realistic) picture that what would be suggested by GDP and it helps establish that this is not just about unusually high US consumption levels due to greater credit access or some such. The problem, such as it is, is not so much that US has exceptionally high consumption or unusually high disposable incomes relative to its GDP (it’s only slightly above average), but that the relationships between NHE and these determinants of NHE are non-linear and the few other high GDP countries have unusually low consumption and low disposable incomes relative to their GDP. US consumption or disposable incomes lean a bit high relative to GDP, but not dramatically so. It’s countries like Norway, Ireland, etc that in recent years are obviously well off trend and these residuals have significant implications for what we can expect in NHE/GDP terms. And the respective slopes are virtually identical whether or not we restrict this to countries with reasonably normal consumption shares (between -1 and +1 SD). Also if we run these through OLS with different model specifications the differences between these two predictors are stark. What all of these models suggest is that GDP has little, if any, informational content vis-a-vis NHE once AIC has been accounted for. High GDP countries with low AIC are predicted to have low NHE and low GDP countries with high AIC are predicted to have high NHE. We get much the same results with my aforementioned time series data using [gross adjusted household disposable income less NHE] and [AIC less NHE]. By crudely removing NHE from comprehensive household consumption or disposable income like this we remove a big part of the signal and likely significantly overstate the role of these other GDP components (which nonetheless come out as quite modest), but still we can pretty clearly see that it is the household sector and/or broad measures of consumption that are doing nearly all of the work vis-a-vis GDP and NHE and that it’s not just because of some weird mechanical effect due to ~100% of NHE showing up in these figures. There are clearly strong affinities between overall household consumption or disposable income and national health expenditures that we don’t see elsewhere in GDP. The differences in incremental predictive utility between these more household-centric measures and the remaining components of GDP are not just due these nations being inherently different. We also find these same sorts of effects within countries with random effects models using the time series data I constructed. There aren’t enough observations to take most individual country level estimates very seriously, but the overall distribution and average estimate is quite informative. This suggests that the elasticity of adjusted household disposable income is much greater than the elasticity of the sum of these remaining components of GDP (and frankly that’s probably a substantial over-estimate due to model specification). It further suggests that on average NHE is growing much faster than these other components of disposable income and that the growth in disposable income largely explains this increase. These disposable income estimates would probably be more consistent and larger in real terms with a non-linear specification (you might notice that the richer countries skew high and poor low) and without crudely subtracting NHE from disposable income, but I’m trying to keep this relatively simple and anticipate some objections here. The effect of non-health consumption (or household disposable income after adjustment for NHE) is much larger than the remaining components of GDP even when we look within countries. Keep in mind that CMS also finds (household) disposable income to be a superior predictor, i.e., they routinely find disposable income predicts the long term movements of NHE (especially non-government NHE) exceptionally well and much better than GDP. As comprehensive household disposable income increases and matches that of, say, the United States, these apparently low-spending countries are likely to see very similar increases in NHE. Unsurprisingly, we find much the same results with adjustments to AIC (and it has more observations to work with). Even with this crude model we find non-health consumption predicts NHE increases within countries to a much greater degree than these other components of GDP. Singapore consumes much less of everything overall, not just health care, and this has been true for several decades. All my analyses strongly suggest that the actual household economic situation, especially consumption, ultimately determines NHE to a much greater degree than any other economic factor, so their “low” NHE as a share of GDP is not shocking. Looking at NHE as a percentage of GDP confuses these comparisons more than it helps. Countries that combine high GDP per capita with high AIC shares are going to tend to skew very high for NHE as a share of GDP whereas even those with very high GDP per capita are apt to skew low if they have low AIC shares. Crediting the health systems for low NHE in countries with low AIC makes little sense and vice versa for high AIC countries. If we are trying to determine how effective different health systems are at cost containment it makes much more sense to look at this from the household economic perspective (e.g., household disposable income, AIC, etc) rather than economy-wide measures like GDP. There is much less dramatic and persistent difference between countries in NHE after we have gone through this exercise (certainly much less than is popularly supposed) because much is explained by these indicators, but to do otherwise is to vastly increase the probability of drawing the wrong conclusions from the data. Some countries’ health systems deserve a more “credit” and some countries deserve less. By and large it is those with obvious rationing mechanisms with substantial negative residuals….. but these tend not to last for very long in the facing of rising disposable incomes (or AIC) because rationing itself is unpopular. Although comparing NHE in percentage of GDP terms confuses more than it enlightens since this is much more determined by household economics than GDP per se, it’s worth briefly showing that even crude non-health consumption models outperforms GDP as a predictor of NHE in percentage of GDP terms. Again this is working against a handicap because we’re missing big part of the consumption signal due the subtraction of NHE (and rather systematically against high spenders). GDP ought to outperform according to popularly held views, but it clearly does not. The point here simply is that the consumption share of GDP and the actual per capita consumption levels largely dictate the NHE share of GDP. Countries that combine high AIC with above average AIC shares of GDP (e.g., United States) are very likely to show exceptionally high NHE in percentage of GDP terms in the long term (+/- a few years due to lag). Countries with low consumption shares and/or low absolute consumption are likely to show low NHE shares. 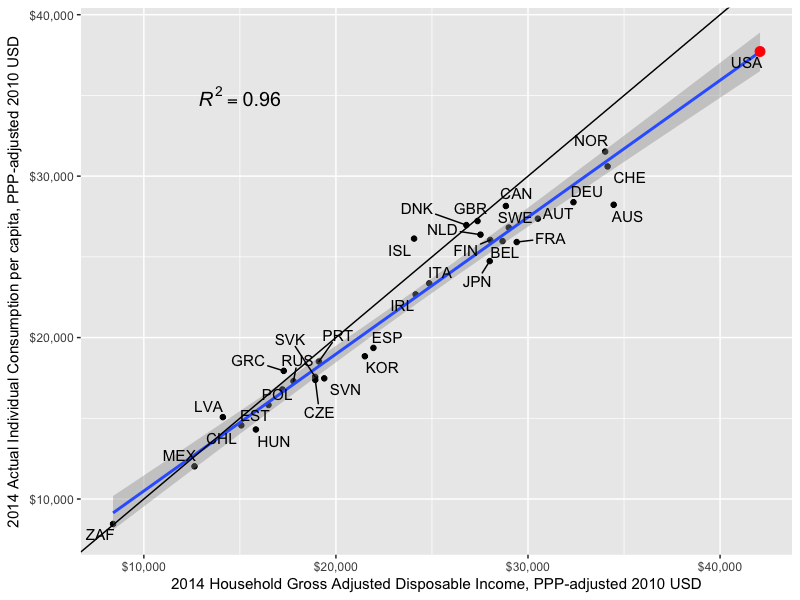 Much the same holds for measures of household disposable per capita and as a share of GDP. I created a git repository on Github for this work. It includes the raw data, code, and estimates for actual individual consumption per capita and household gross adjusted disposable income per capita as I derived from SNA tables. Also included are the cleaned up World Bank ICP data, and similar data from OECD for crosschecks and other analysis that I used to supplement some of this analysis.